Meera - It's time for a technology update so I'm here at the BBC television centre in London having a coffee with our resident expert, Chris Vallance. Chris, it's been a few months since we've heard from you. What's been happening in the world of technology? Chris Vallance - One of the high points for me was the UK's first ever Maker Faire. Making is quite the craze in the US. It's homebrew technology, DIY technology and people who have a real enthusiasm for gadgets and tech and who want to make it themselves out of kits or out of everyday objects, pulling things apart, putting them back together again. 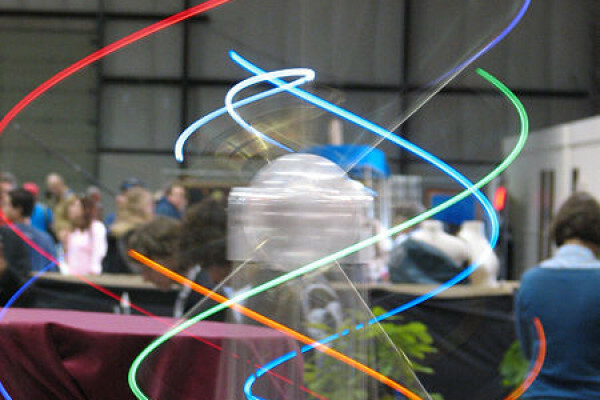 The Maker Faire in Newcastle brought dozens of British enthusiasts together. We saw all kinds of things on display from homemade robots to robotic musical instruments to even technological jokes. There was somebody who'd made a kettle that wouldn't boil if you looked at it, like the old proverb. Somebody had built the computer game Lunar Lander. Instead of making a computer screen like a traditional computer game they'd made it out of bits of wood and string so you were actually controlling a physical space ship rather than a computer graphic: lots of wonderful things on display. Here's just a very short sound tour of the Faire. Inventor1 - It's a hand-activated remote player, or harp. You put your fingers on the inside and it makes nice tinkly noises. Inventor2 - All the things on this store are robots of some kind. Most of the stuff is made out of tat and Uncanny Valour is no exception. She's a very lovely 1950s doll that I've roboticised to make a sort of soothsaying doll. Later on this afternoon she's going to be doing a very impressive, I hope, mind reading trick. Chris Vallance - Some of the sounds of the wonderful things you can find at the Maker Faire. There is a more important point here. Some of the people who were there were selling electronic kits, if you like a garden shed-type business. All of them said their businesses were doing very well which is interesting given the current credit crunch. Meera - That event took place in the UK but you've also been finding out about what's happening in the United States. Chris Vallance - One of the challenges in computing is how to best-enable humans to interact with computers. We have keyboards, we have the mouse but what does the future hold/? That was one of the topics being discussed at a major US conference. The Computer-Human Interaction conference bringing together researchers from across the US. My colleague, Clark Boyd who is the world's technology correspondent went along to the conference and was given a tour of a very interesting piece of technology which, if you like, turns the computer into something that sits in the background and watches what you do and responds to your actions. It's produced by a group of people at MIT - the Massachusetts Institute of Technology. It's called Sixth Sense. The way it kind of observes what you do and interacts with you is a little bit spooky. I got Clark to explain more. Clark - Essentially, what it is trying to do is to turn your entire environment, any surface into a computer complete with an internet hook-up. First of all, you have to wear a projector around your neck, a tiny projector. You have to wear a tiny web camera around your neck. What the web camera does is that, working with some home grown software that they've created, it detects the different movements that you're making. The different movements that your hands are making. It can detect objects that your hands are interacting with. It determines what you're interacting with, what you're trying to do with it and then it goes on the internet and searches for information that you might find useful in that situation and projects it through this tiny projector onto any surface around you. It's hardly bigger than a small camcorder device. It's pretty amazing what they've managed to put into this. This is commercially available hardware. The hardware only costs about $50. All of the real power of this is the software and getting the software to recognise your gestures. Recognise the objects that you're interacting with and then getting it to pull up the right kinds of information. Chris Vallance - They've called this Sixth Sense but it's actually more like another movie, isn't it? Minority Report. Clark - yes, it's very similar to that. In fact it's funny when you speak to Pranav Mistry, the MIT graduate student who's heavily involved in the project. He actually cites that film, Minority Report, as being the inspiration behind it. Chris Vallance - It is obviously very early days for this technology. It looks like a prototype. When you see it in action it's both mesmerising in the sense that it projects screens and interfaces onto walls and surfaces and hands. You also look at it and you do wonder if you wandered round the streets with this you might get some very funny looks indeed. It is like having an overhead projector dazzling in front of you. Clark - That was one of the questions that I put to the team at MIT. I'm sitting there thinking to myself, yeah well you're sat there in the airport. All of a sudden this guy gets up and he walks over to a blank wall and starts making all these strange gestures with his hand and all the sudden he's opened his email up on this wall. He's there leafing through it with his hand. What about socially and culturally? Is this going to take off, is this going to fly? One of the lead researchers on the project, Pattie Maes, said: "I personally don't find it any stranger than people walking around with Bluetooth headsets on, seeming to talk to themselves all the time. This might actually be more socially acceptable." Meera - That was Clark Boyd, describing the MIT's Sixth Sense. T's going to be a while before this is actually on the market, isn't it? Chris Vallance - It's very much a prototype at this stage. Like all prototypes at this stage it sounds a little far-fetched. It will be interesting to see if it, like many others becomes something mainstream in the future.